A 10-year-old Chinese boy has committed suicide after being banned from watching television by his father. 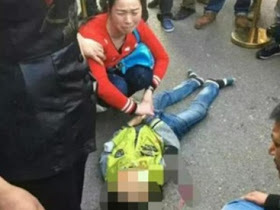 The child, from south-west China's Chongqing city, jumped from his apartment on the 19th floor and landed on a car parked on the street. The boy was pronounced dead at the scene. He jumped off the building from his bedroom window and hit the bonnet of a white car parked on the street before falling to the ground. After initial investigation and post-mortem examination, the police said the boy was angry because he had been banned from watching TV, which led to the jump. Pictures show the incident drew a large number of onlookers. Shattered glass can be seen on the white car's windscreen and blood stain on the bonnet of the car. Lv's family members cried as they held the body of the 10-year-old. They said they would arrange his funeral once the police investigation is finished.